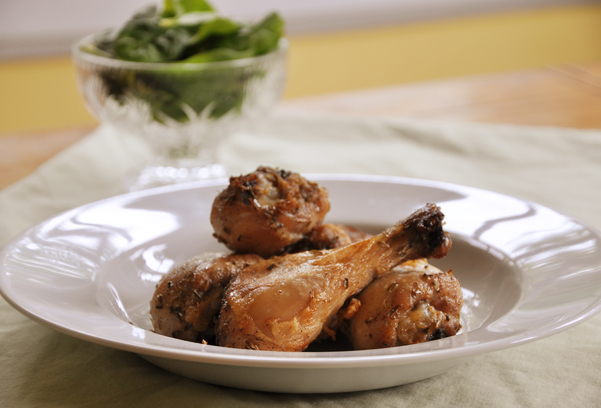 Roasted at 425F, these thyme chicken drumsticks are crispy baked chicken legs with the simple flavours of thyme and garlic. This family staple is the perfect meal to feed a crowd. Chicken is something that can become boring over time, it’s such a staple food in most households that it just never seems to be something special. Well ladies and gentlemen, let me present you Thyme Chicken Drumsticks. I’m like all of you, always on the hunt for new chicken recipes, I can’t even begin to tell you the amount of times I’ve looked through Martha Stewart’s 100 Chicken Recipes, it’s too embarrassing. Now, here’s where I think a lot of people go wrong, myself included, please stop always buying the boneless, skinless chicken breasts. They are in no way, shape or form the best way to enjoy chicken. It’s like going to the movies and deciding between seeing the newest five star reviewed drama and the half star rom-com. Ok, I’ll admit that I’ve chosen the half star rom-com before, but it’s never better than the drama. Sometimes go for the chicken breasts, but 9 times out of ten go for chicken legs, or chicken wings or chicken thighs. Unless you’re planning on making Shredded Chicken Tacos, in that case run for the chicken breasts, it’s worth it. These drumsticks have a slight crunchy skin and the meat just falls off the bone. They are so extremely easy to make that you won’t believe how good they taste. These are definitely a new staple in my house. I like to roast chicken legs at 475F which is a super high temperature, but that’s how these get that delicious crispy skin. Make sure that your oven is clean so that you don’t set the fire alarms off. Another trick I like to use is to trim some of the excess fat off of the chicken legs before roasting, this eliminates some of the fat drippings which will lessen the amount of smoking from the chicken. If you’re looking for more recipes using chicken legs, try my buffalo chicken drumsticks — these are the perfect addition to any game day activity! A simple and flavourful chicken recipe that takes minutes to prepare! Combine spices and thyme in a small boil. Place chicken in a ziploc plastic bag. Add half of the spice mixture and shake bag around to coat chicken. Add the remaining spice mixture and shake around again to evenly coat. Add the olive oil, shaking one last time to evenly coat chicken with oil. Place on a baking sheet and bake in the oven for 20 minutes. Flip chicken over and bake the other side for another 18-20 minutes. These thyme chicken drumsticks are so delicious you’ll be making them weekly. Excellent!! It was easy and delicious!